If every career path begins at home, then Thomas Vincent Bluy is no exception to this rule. The 33-year-old Frenchman cites his grandparents as his fi rst teachers: His grandfather would go hunting, and his grandmother would cook whatever her husband brought home. 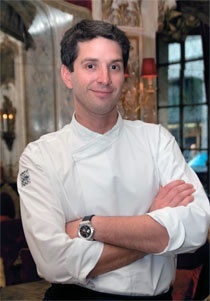 Early on in childhood he knew that his greatest passion was cooking and went professional at the age of 16 at a hotel in the city of Auch in southwest France. After earning his C.A.P. diploma, he did some traveling in France, Belgium, and Lebanon. After a cooking stint in Sydney, Australia, Bluy returned to France before spending four years working as a chef in Spain, his last stop before the wind blew him to Russia. Why did you decide to come to Russia? It wasn’t that I was dreaming to come, I just had the chance, and I always like a challenge. Last November, a friend of mine who is a DJ told me he was planning to go to Moscow on weekends to work in a big club. I was free at the time and just decided just to go with him. Someone here, I don’t even remember who, told me that they knew of a restaurant that needed a chef, so I sent my CV. Then I found myself preparing a tasting here at Most. It was such a quick decision? Yes, it was. I figured there are so many opportunities in life. Four years earlier I found myself in almost the same situation. I went to visit a friend in Marbella [Costa del Sol, Spain]. One day we were sitting at a café, and an acquaintance of hers who came to join us said that they needed a chef for their new restaurant just across the street. So I went there and they hired me. That’s where I was working before I left to come here. I believe that there are chances you should never miss in your life or you regret it. The only difficulty for me here is communicating with people because not everyone knows English. But I will start learning Russian, a lesson every week. There are no other difficulties about living and working here? I’ve been living in foreign countries since I was 22. When you go somewhere new, for the first one or two months you don’t know anyone. I just don’t have time right now to meet people; I’ve only just started. Were you thrilled when you found out that they wanted you to change the menu completely? I managed to do it in two weeks. It was a real challenge, but communication is only a problem for someone who doesn’t want to communicate. Since I wanted to, I just explained everything my way -- with gestures and intonation. People watched me and learned, and by the third time they could make the dish by themselves. But if you want to ask me about the real challenges, well... I tried to keep my creativity in check and take into consideration that sometimes it is hard to get fresh produce and that sometimes people here are not ready for a classical French menu. 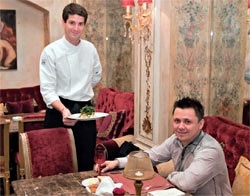 It was one of the goals with the new menu was to combine the classics and modern French cuisine. Could you say a few more words about the menu? Are there any dishes you invented? Oh, I am not a genius! The things I do here are our traditional haute cuisine, mostly the things that I know from my childhood and then saw in French restaurants where I worked. The outlet for my creativity as a chef is figuring out how to take ingredients and turn them into a good and interesting product that reflects the cuisine of Cote d’Azur: fresh, sunny, colorful, with different and surprisingly perfect tastes and smells. Fillet of goatfish 250 gr. Cook the fillet on both sides (do not remove the skin). Cut the celeriac into little straws and mix with the mayonnaise and mustard. 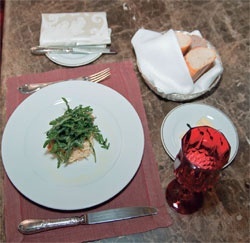 Arrange the salad in the center of the plate, and drape the fish over it. Cover it with the rocket salad leaves dressed with the vinegar and olive oil. Drizzle olive oil around the plate.